Storypath » What Will Grow? Summary: The bright cover, dominated by green fields and a giant sunflower opens to display fifteen to twenty different seeds on the end pages. Then on each following double page a rhymed couplet describes a seed, asks what will grow from it, and shows the plant in various stages of growth: peas, lettuce, radish, sunflowers, tomato, pumpkin, dandelion, milkweed, apple tree and oak, There are four pull-out gatefolds that show abundant lettuce, a tall pine, or deep rooted carrots.. The book concludes with gardening information about the seeds. 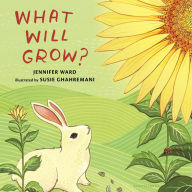 Theological Conversation Partners: What Will Grow is a delight to read and share with a child and it may be the doorway to a wonderful experience with gardening. It is one way to emphasize the wonder of God’s creation, the rich variety, the marvel of life within a seed. And seeds are available on the ground and for sale for experiments, comparisons. Seeds occur frequently in the parables Jesus told. The Kingdom of Heaven is like a mustard seed, like a field sown with wheat and weeds. A sower went forth to sow and the results depended on the kind of soil that received the seed. Agricultural images occur throughout the Bible and some experience with plants and their growth will contribute to understanding. The Bible refers to God as a gardener. Genesis 2:8 says God planted a garden, Psalm 65:9-11 describes how God waters the earth. Each seed is different. How are they alike? Each seed is different. They all need at least 3 of the same things. What are they? Seeds grow into plants that feed animals as well as people. What animals did you see with these plants? After the picture of the tall pine tree there is a picture of a garden planted. Do you recognize any of the seeds? Can you tell what they will become? Plant a garden, perhaps in a pot or in the ground. Pick out some seeds described in the book and watch them grow. Thank you to frequent reviewer and alumna Virginia Thomas for this week’s book review. What Will Grow? by Storypath is licensed under a Creative Commons Attribution-NonCommercial 4.0 International License.